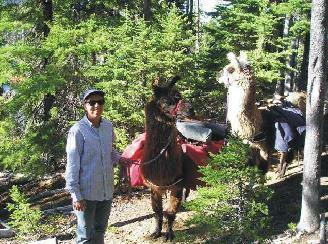 Meet Llonzo and Manchester, two of Happy Hiker Llamas' seasoned pack llamas. They will spend the next four days packing camp equipment, food, water, and trail clearing tools through the Diamond Peak Wilderness area while we humans clear 15 miles of trails, eliminate illegal camp fire sites and pick up trash. Llonzo will start the trip packing 85 lbs and Manchester will pack 65 lbs. Their loads will decrease as the food and water is consumed. 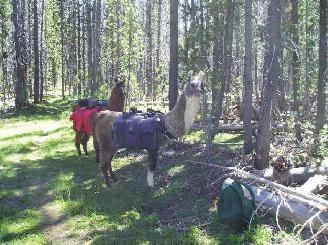 Trail clearing can be particularly grueling for the llamas as it is necessary to stop frequently to clear the trees that have fallen across the trail. 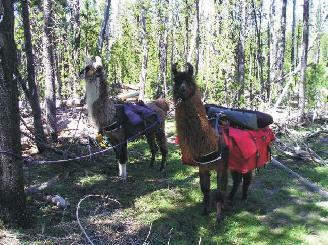 The llamas end up spending a considerable amount of time just standing around while still carrying their full pack load. 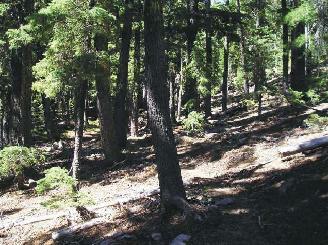 A 4-5 mile hike that would normally take 2.5-3 hours can easily slow down to 6-7 hours or even longer. 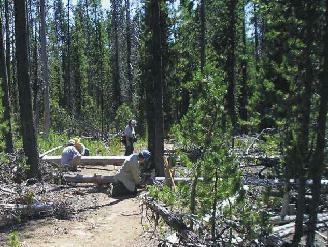 80+ trees are cleared the first day on the 4.5 miles of trail from the east side of Odell Lake to Fawn Lake. 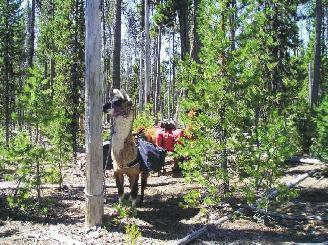 Trail clearing is not all work, though. 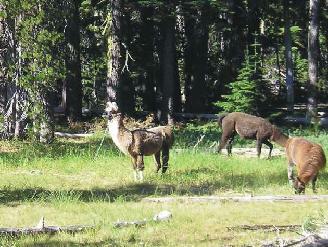 Camp was set up overlooking Fawn Lake and the llamas are staked out in a nearby grass meadow. 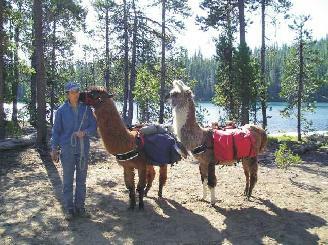 We will stay at Fawn Lake for two nights giving the llamas a well deserved rest. 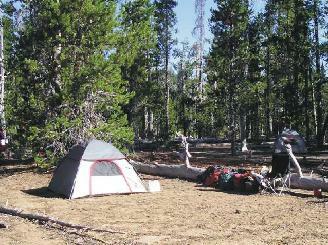 On day two we humans eliminate any camp fire sites that are closer than 100 feet to Fawn Lake. 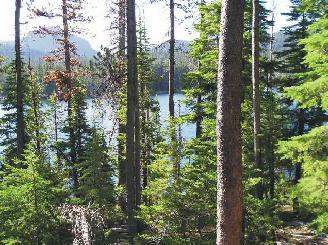 The 1.5 miles of trail leading to Pretty Lake is also cleared. 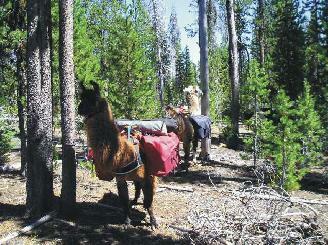 Any trash sighted along the way is also collected and will be hauled out. 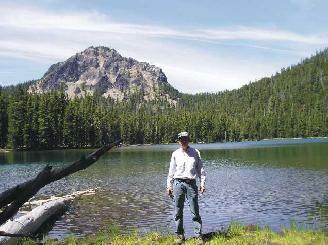 A shot of Stag Lake with Lakeview Mountain in the background. We cleared 1.5 miles of trail leading to Stag Lake and eliminate any camp fire sites closer than 100 feet to the water on day two. 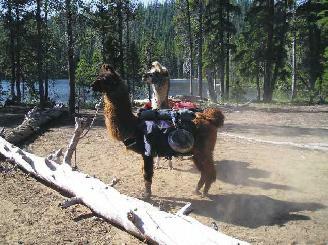 Back at camp by Fawn Lake, there is plenty of time in the afternoon to take a refreshing swim. The water is suprisingly warm as Fawn Lake is a very shallow Lake. Llonzo is quite anxious to get started on day three and has stirred up a nice dust cloud. He will carry 80 lbs while Manchester will carry 60 lbs for 7 hours while we clear 5.5 miles of trail. 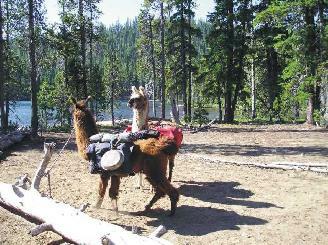 We head west from Fawn Lake and go by Saddle Lake as we clear the trail and make our way to our next camp site at Diamond View Lake. 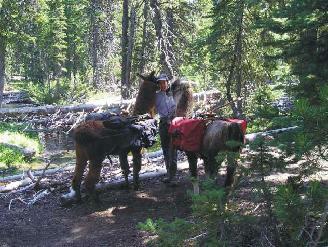 The scenery is so remarkable and peaceful on the wilderness trails where no machinery is allowed; i.e. no motorized vehicles, no chainsaws, etc. 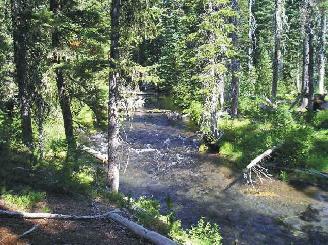 Here is a shot of Trapper Creek on day four as we hike the 5.2 miles to the trailhead on the west end of Odell Lake. Llonzo and Manchester tell me they want to come back really soon.